DuVino creates fun wine accessories and unique funny novelty beer and wine glasses with sarcastic jokes, memes and hilarious sayings. Imagine their face when they open the box to find "I Drink And I Know Things" beer glass. They'll LOL and think of you every time they take a sip of their favorite drink and smile for years to come. Our glassware is designed, made and packaged in the USA. The fun logos are printed and then oven fired to ensure a long lasting, dishwasher safe finish. We inspect each glass for any flaws in print or scratches before we roll each glass in bubble wrap for safe shipping. We then lovingly pack in a durable white box ready for gifting! Your happiness is our priority and we know that when you have given the perfect gift to a loved one, we've done our job. 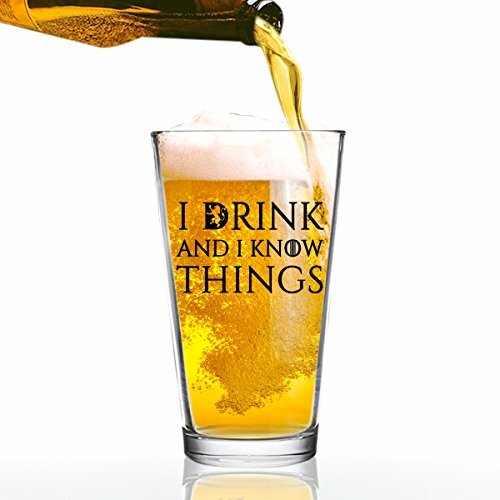 UNIQUE GIFT IDEA - A Perfect Gift For The GOT And Beer Enthusiast. Packed In A Sturdy White Gift Box, Your Gift Recipient Will Smile And Think Of Your Every Time They Drink From Their New Favorite Glass.